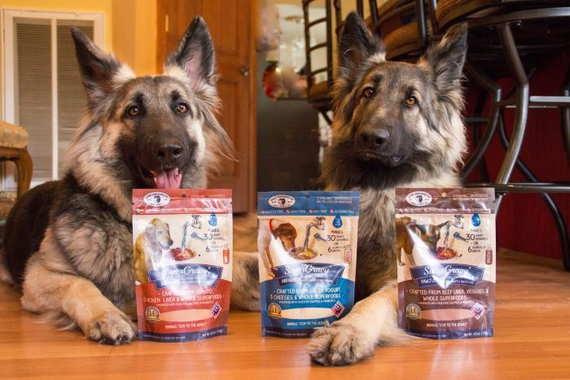 Choose 1, 2 or all 3 award winning flavors of SuperGravy Dog Food Topper for just $9.95 each ($15.95 value each) from Clear Conscience Pet. 100% guaranteed to bring JOY to the BOWL for every dog NOW Enhanced with digestive enzymes and probiotics for better digestion with every meal NOW formulated to make either delicious gravy by-the-bowl or yummy hydrating BROTH by the jug! STILL only 50 cents per gravy serving or $2.50 for a full quart of broth. Supergravy is Easy to Use! BROTH: 5 scoops per qt./ltr. of water. SHAKE broth well before using. ADD BROTH (8oz/250 ml +/-) and stir well. WAIT a few minutes before serving for full fusion of gravy with food. We started Clear Conscience Pet to create PURE products that you can TRUST, made with limited SIMPLE ingredients. 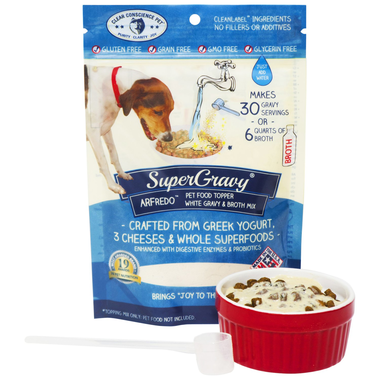 SuperGravy® solves the problem of picky eating pets by transforming hard dry food into a delicious moist meal. It blends better and costs far less than adding lumpy canned food to kibble. And you’ll be the earth’s best friend since SuperGravy generates far less waste than cans. 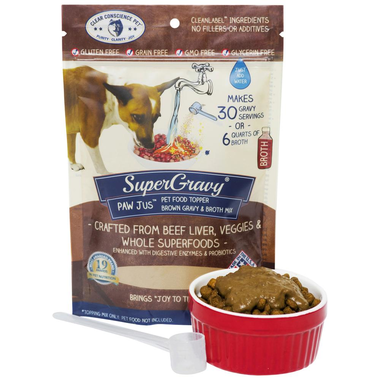 ALL DOGS EATING DRY FOOD will enjoy their food more and digest it better with SuperGravy®. Simple as that. USING CANNED FOOD AS A TOPPER? 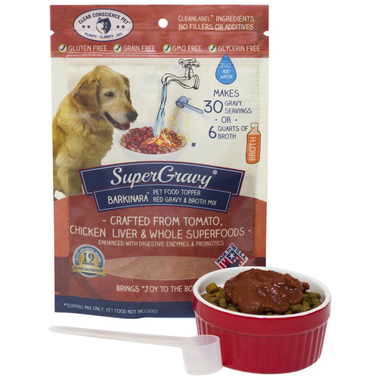 SuperGravy® costs less per serving, blends better with kibble, and eliminates can waste. USING FREEZE DRIED? Hydrate with SuperGravy® and water! DOGS LOVE BROTH! Don’t wait for dinner; serve up some yummy broth as a ’tween meal hydrating boost! Dried tomato, dried chicken liver, chia seed, sea kelp, dehydrated beets, dried sweet potato, dried pumpkin, dried porcini mushroom, sunflower lecithin, protease, amylase, lipase (digestive enzymes), Lactobacillus acidophilus (probiotic). ¡Sé el primero en comprarlo!